Did you know that there are only 3 remaining Farmways in Singapore? In the past, the rural parts of Singapore were dominated by farms which resulted in the roads that led to the farming areas to be known as Farmways. Today, Murai Farmway, Seletar West Farmway and Pasir Ris Farmway are home to a variety of vegetable, fish, and pet farms. 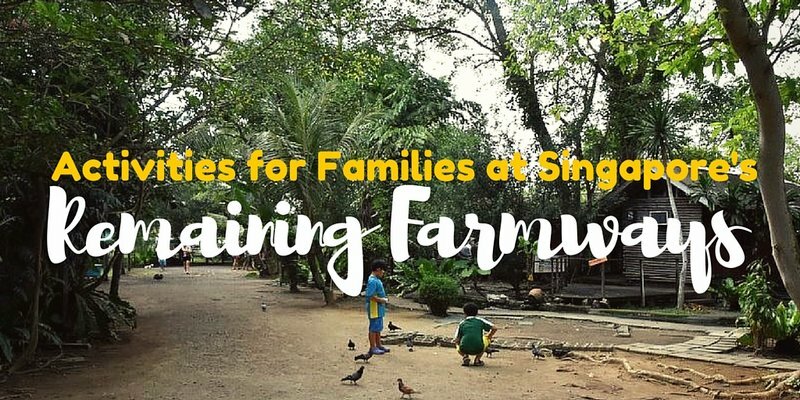 Of course, there are still other farms found in other parts of Singapore, like those at Kranji Countryside, but I decided to check out these 3 surviving Farmways to see if there are any gems worth bringing kids to. So over 2 weekends, the monkies, the wifey and I visited the farms at the 3 Farmways and to our surprise, there were actually plenty of activities good for a weekend out with the family. If you are tired of the usual malls, playgrounds and parks, go off the beaten track right here in Singapore and pay farms like a mini zoo, marine fish aquarium and even an oh-so-cute bunny headquarters a visit! Located near the Lim Chu Kang area, Murai Farmway consists mainly of foreign worker dormitories, Chew's Agriculture Pte Ltd (yes, the one who produces fresh eggs), a plant nursery and an organic farm. The latter is Quan Fa Organic Farm, which has grown from humble beginnings of a small organic vegetable retailer to one of the leading distributors in Singapore today. Free of pesticides, chemicals and fertilizers, this family-run farm grows all sorts of fruits and vegetables including pumpkins and brinjals. Its doors are open to public and the farm welcomes everyone to take a peek around. In addition, they also organise educational farm tours for groups (min. 20 pax). Visit HERE for more details on various packages. If you fancy bringing back home some fresh produce, the farm also has a little air-conditioned shop to stock up on the greens. Located nearby is a plant nursery named Koon Lee Nursery, which sells a range of plants as well as gardening and landscaping supplies. The nursery is pretty huge so if you are looking to purchase some flowers and plants, chances are you will not be disappointed. I am no gardening fan but it seemed to me that the prices here are cheaper than the more established plant nurseries in Singapore. So we ended up buying plenty of seeds as the monkies expressed an interest to grow some plants of their own! Located off the main road of Jalan Kayu, Seletar West Farmway once consisted mainly of pig farms. Now, due to the rapid development of Sengkang town, all there remains is a few fish farms, an animal lodge and a mushroom farm. We did not manage to visit the latter as Myco Mushroom Farm (9 Seletar West Farmway 5, Singapore 798057) was already closed when we visited (Opening hours: 11am to 4pm). Apparently, the farm is Singapore's only specialist mushroom grower and also conducts tours of its facilities. Despite the ongoing construction, a portion of Seletar West Farmway still retains its rural and rustic charm... thanks to the one place that I think appeals most to kids - The Animal Resort. 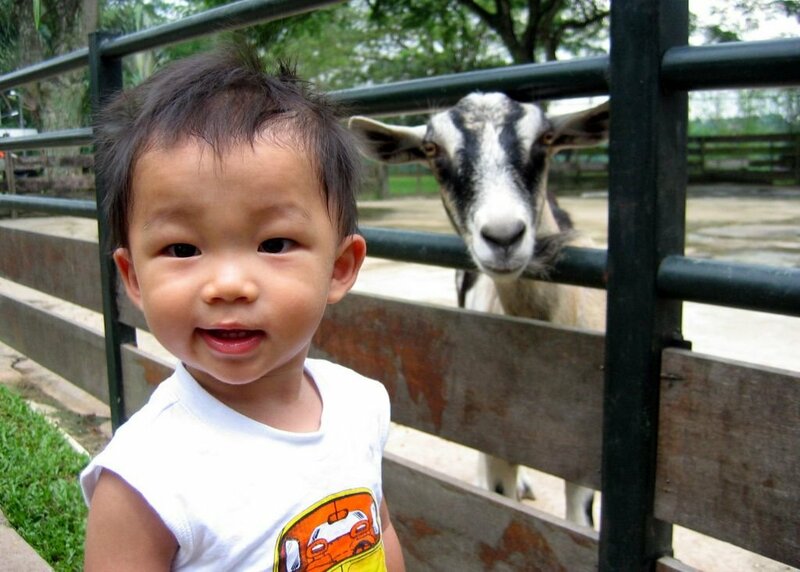 If you are looking for a place for your child to have close encounter and interaction with farm animals just like the good old kampong days, then the Animal Resort is the place to go. What’s more, entrance is absolutely free! Spread over five acres, the Animal Resort allows kids to get cosy with geese, peacocks, fishes, chickens, ducks, rabbits, guinea pigs, a horse and cassowary. For $1 a packet of feed, kids can also feed the animals to their hearts’ content. Kids will no doubt be thrilled to be able to feed the animals, since some of them like the geese and chickens, are free to roam around. Oh, and which kid can resist feeding a horse too? Actually, we first visited The Animal Resort in 2006 when Ash was just less than 1.5 years old and we have been back a few times since (as my previous blog entries will show). Gosh, he looked so cute and tiny then! If you are there on a Sunday late afternoon, head to the German Shepherd Dog Club Training Ground at the rear of the farm to catch German Shepherd Dogs undergo training too. Of all the 3 Farmways, I think Pasir Ris Farmway houses the most diverese farms of the lot... including more farms to visit than the previous 2 Farmways combined, thanks to the many pet farms, animal shelters and fish farms located there. If you kids love marine and exotic fishes, then you can't go wrong at the farms situated at 22 Pasir Ris Farmway 2! Block C is home to a wide variety of marine fishes on sale. Finding Nemo or Dory? Definitely no snorkelling or diving needed here! There are even plenty of corals to gawk at too! For a glimpse of huge arowanas and other exotic fishes, walk over to Block B. Yes, the monkies were fascinated by the numerous stingrays alright. Located behind Pasir Ris Farmway 3 and along Pasir Ris Coast Industrial Park 1 is Tropical Fish International. An importer and exporter of tropical fishes, aquatic plants and aquarium accessories, it offers a variety of fishes for sale. But the find for us here had got to be these fishes. Fighting fish! And the cheapest ones start from $5! Little surprise that the monkies wanted to rear a fighting fish of their own then. And so began the long process of picking out their fave of the lot. We have had the fighting fish for close to one month now and I'm happy to report all of them are still alive! Within its premises, there are also prawning and fishing ponds as well. How about fishing for the kiddos, you ask? Relive the good old days at Mainland Tropical Fish Farm with some classic longkang fishing and bring home all fish caught. Or if you are up for a bigger challenge, head to the prawning ponds for a more prized catch! If you prefer to relax, pamper yourself with fish spa therapy at the spa centre. There are also plenty to see: Arapaima (the largest fresh water fish in the world), koi, stingrays, red and silver arowanas, huge catfishes, turtles, terrapins and freshwater prawns. Pasir Ris Farmway 2 is also famed for its many animal boarding houses and dog kennels but did you know the ultimate cuteness overload lies within the premise of Ericsson Pet Farm? Comprising of a humble little shop started by a group of rabbit owners, Rabbit Headquarters (RHQ) believes in keeping its batches of rabbits in small numbers but superior quality that goes well beyond commericalisation. RHQ specialises in hand-picking and breeding their rabbits to produce bunnies of both quality and good temperament, and by caring for their health and well-being. And obviously, the stars of RHQ have got to be the rabbits. SO CUTE RIGHT??? I think the monkies (and wifey) fell in love with almost single bunny they cuddled. If you are new to the world of bunnies, but are thinking of rearing one and yet not too sure what to expect, RHQ will be a great place to ask questions and set your mind at ease. In the short time that we were there, the monkies learnt a fair bit about bunnies... including the proper way to hold them. I am pretty certain that there are other farms within the 3 Farmways that we missed. So if you know of other farms, please let us know in the comments below. Thanks in advance! The rabbit headquarters seem closed and demolished, able to please help confirm my understanding? Been following your blog for many months now and wish to express gratitudes for doing such a wonderful great job! Hey, can please check if this is still open? Seems closed. For Rabbit Headquarters, its Facebook page is still functioning and from the looks of it, they had some Christmas activities so I do not think they are closed. As for 22 Pasir Ris Farmway, I'not too sure if they are still open as our visit was earlier in the year. If you do head down and confirm that it has closed, please let me know. Thanks!